The WM of Lune Lodge No 4724, Paul Morgan, welcomed Assistant Provincial Grand Master David John Winder to their annual installation ceremony, as the principal guest for the evening. 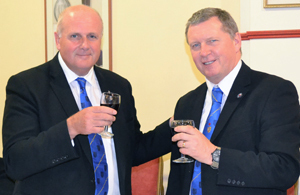 David Winder (left) toasts the health of the new WM David Shaw. The meeting at Lancaster Masonic Hall, saw Andrew David Shaw, a relatively new joining member of the lodge, installed as WM. David had served as master of Poulton Le Sands Lodge No 1051 in 2016. Accompanying the APrGM on this important occasion were Jim Wilson, Lancaster and District Vice Chairman Scott Devine, group secretary Chris Larder and acting Provincial grand officers Chris Tittley, Reg Wilkinson, Les Newlands, Graham Dowling, Ben Gorry, Jim Stewart and John Pitches. The meeting commenced with Paul opening the lodge and after proficiently completing lodge business, the director of ceremonies Doug Willoughby rose to ask for permission to retire from the lodge, only to re-enter moments later to announce that the APrGM stood without and demands admission. After Paul had formally welcomed David, on behalf of the brethren of Lune Lodge, Paul offered David the gavel, who humorously replied “I am sure you would”. In returning the gavel, he added that although it is always a delight to receive the gavel, do not worry about what is to come, just enjoy the day. David winder (left) congratulates Doug Willoughby for his years of service as the DC of Lune Lodge. In a ceremony that attracted many plaudits, the most praiseworthy had to be reserved for the presentations of the working tools of the three degrees, all of which were given by brethren who were wearing the ‘light blue’ apron. The working tools of a master Mason were given by Paul Seacy, those of the second degree by Philip Tarbun, and the working tools of the first degree by Simon Robinson. All were delivered with poise and attracted great acclaim from the brethren. No less praise worthy were the addresses to the master, wardens and brethren. The address to the master was given by Frank Heath, that to the wardens by John Heaton and the address to the brethren by David winder. Further addresses of note, especially as they were given by some of the acting officers, were the address to the senior deacon by the acting Provincial Junior Grand Deacon Reg Wilkinson and the address to the junior deacon by the other acting Provincial Junior Grand Deacon that was present, Chris Tittley. 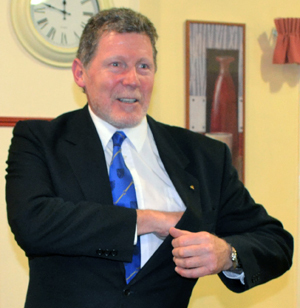 Not to be left out, acting Provincial Grand Steward John Pitches gave the address to the stewards. At the close of the ceremony David was delighted to bring the greetings and congratulations of the Provincial Grand Master Tony Harrison. 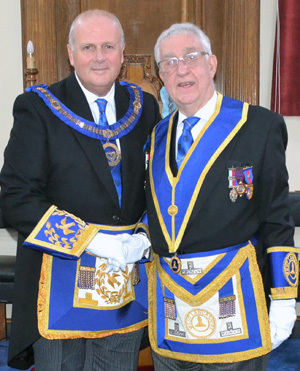 He felt sure that had Tony been able to attend in person, he would have extended his warmest greetings to David and also to the immediate past master Paul. David then strolled around the lodge congratulating those brethren who had taken part in the ceremony, an act much appreciated by all. David made a special mention of the DC Doug Willoughby, who was standing down from the post, after many years of diligent service, for this Doug received a round of applause. Before sitting down, David remarked how wonderful it was to witness the friendship in the lodge, it had been a ‘super day’. Who says ‘Festive Boards’ are not enjoyable. David was also impressed with the notification of disbursements to charities and good causes totalling £1650. Included in this magnificent sum was a donation to the MCF 2021 Festival for £650. In response, David commented that although Lune Lodge was not big in number, it was certainly big in heart. The Festival of St John was held in the Rowley Court banqueting suite, where David enlightened and entertained the brethren with an amusing and informative response to the toast to the grand officers. Addressing his audience, David was grateful for the warmth of the welcome shown to him, adding it “was great to work with a live audience”. He was very pleased to be able to offer his own personal congratulations to David on attaining the chair of this very fine lodge and hoped he enjoyed a wonderful year, both to his satisfaction and the benefit of the lodge. David also congratulated again all who had taken part in the ceremony, an excellent team display. An action picture of Frank Heath preparing to give the toast to the master. Staying with the ‘team’ theme, David was delighted to see so many brethren wearing the Provincial tie and although it was bright, that is exactly how it was meant to be, it tells people who we are, wearing team colours are part of what we are and of being open. Gone are the days of hiding our light under a bushel – ‘Enough is Enough’. David then moved to discuss Masonic halls and the absolute need to support them, as David explained “no Masonic hall, no Masonry, no charity and no care for those in need”. He was delighted to see a number of brethren wearing the Royal Arch jewel, a most colourful and enthralling degree and the completion of Craft Masonry. David asked those present to chat with colleagues who were not in the Royal Arch and encourage them to think about joining. In conclusion, David enjoined the brethren to enjoy their Masonry and to be strong enough to talk openly to non-Masons about it. Frank Heath, who was David’s proposer into the lodge, proposed the toast to the health of the newly installed master, which included some very humorous observations on David’s personal life, before George Fox gave an excellent delivery of the master’s song with accompaniment from John Heaton. There was a fitting response by David to his toast, which he ended by thanking everyone for their assistance in making it such a night to remember. To complete the occasion, it was announced that together with the £35 from the master’s swindle, the evening had raised £355, a very agreeable piece of news to facilitate the journey home. Pictured from left to right, are: Ben Gorry, Chris Larder, Chris Tittley, Reg Wilkinson, David winder, Paul Morgan, David Shaw, Scott Devine, Jim Wilson, Les Newlands, Graham Dowling and John Pitches.